Since the bottom of the cab has more mass the cab will spin during a front impact. 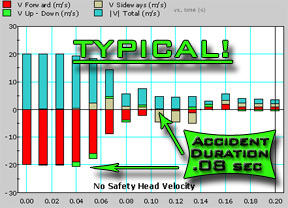 By legthning the impact duration the forces normally associated with a high speed collision are not present. This fifteen minute video walks you thru key principles behind Motion Management. Starting with a simple vehicle design and ending with a complex Delta V of angular acceleration and Mass Moments of rotating Internal Organs of the human body. The Human Brain actually travels 6 feet down an almost straight path while rotating, before going on a 6 feet cycloidic orbital return trip. Equivalent to a 12 feet Crumple Zone! 4 wheeled artist rendition. The cab needs to be sportier. The rear is perfect. You can see the modular construction and how easy it will be to upgrade. This 3-Wheel vehicle is depicted with the Front and Rear Impact Device. The Flex Cab Technology will be a new driver experience. Considering the volume of death, injury, and destruction, the current paradigm of automotive design is operating above automotive safety limits. Automotive safety designs are precluded by an occupant kinematics, which have very low safety limits. In fact, if the automobile structure were designed to survive a collision, the occupants would be subject to greater injury. Designing softer frames with crumple zones reduces the structural integrity and also puts the passenger compartment at risk. Airbags and seatbelts have no effect on the collision forces exerted on internal organs. Until crash durations are increased beyond .004 and .007 seconds, there will be no real solution to this quagmire and ‘acceptable risk’ will remain the current paradigm. 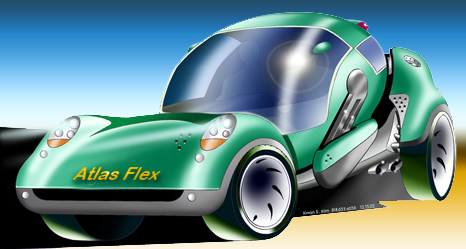 The FlexObile solves both Occupant Kinematics and the automobile Crash Worthiness. By increasing crash duration between .2 and .3 seconds and the occupant stopping distance up to 12 feet, the excessive forces currently associated with a collision are mitigated. The added benefit of rotation will surely mitigate excessive force at 60 MPH or Higher. Another important point is that the dashboard and steering column travels with the occupant and does not become an impacting force. Eliminating the instantaneous crash, the automotive structure can now be utilized without sacrifice. The Delta V between .05sec and .10sec averages to 120 G's, which equals Death! Simply put, no accident here! dramatically when the Stopping Distance is Lengthened. You will never experience a Full Frontal Collision in the FlexObile. Like a Billiard Ball deflection shot the impact occurs away from the Center of Mass allowing for the heavier lower portion of the cab to flow freely underneath the Axis, inducing rotation. As the Fulcrum Arm rises it improves the angle of impact while it lengthens the stopping distance. Now throw in the tug of Gravity and your Upper Torso will just flow through. Angular/Rotational conversion of the Internal Organs offers the unique quality of Mass Moments of Inertia instead of the Centrifugal Force of Spinning. Also, most organs take a Brachistochrone curve since there is a load of Gravity present. However, the motion is quite complex and varies from organ to organ. The Human Leg is below the pulley axis and will experience the Centrifugal Force of Spinning. The Upper Torso will experience Rotation, which is in exchange for the shorter stopping distance. The Brain follows an Cycloidic path While rotating down and up with gravity. design advantages not include in the simulation. Body organs experience extreme pressure when the cab is inverted and the occupant’s head is towards the front of the vehicle, approximately a distance of six feet (fig 4). However, there is no immediate stop or whiplash because of the transferring angular momentum. The rounding effect of the brain against the skull during angular motion will minimize any hazardous pressure duration. The majority of organs are close to the center of the rotation and will experience minimal pressure. 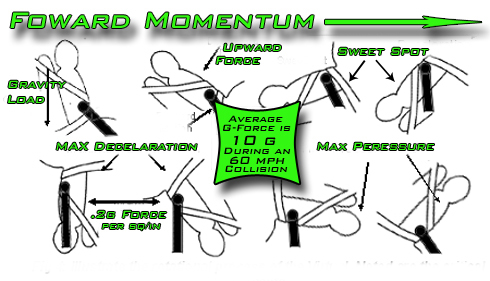 The momentum of the passenger is displaced over the large area of the seat and can withstand large G-forces during the inverted phase. The Rotor Brake will control the timing and magnitude of deceleration. 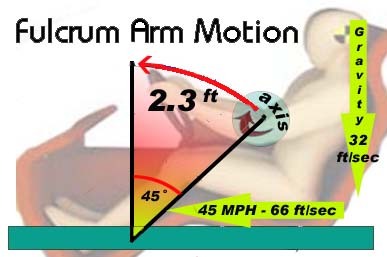 The motion of the fulcrum arm and the crumple zone absorbs the impact until the occupant reaches the sweet spot. This is the most crucial element to Motion Management. Fighter pilot ejection seats accelerate between 12 and 16 G under proper conditions. Acceleration forces acting on the aviator may exceed those of the catapult because of complex behavior of body parts and the seat cushion. The G threshold is 40g with an onset of 500 G per second under controlled condition. 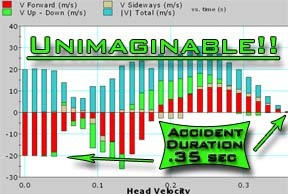 Under more realistic condition peak loads of 20 to 25 G with durations between .03 and .04 seconds can be tolerated safely during ejection. These tolerances decrease rapidly if the occupant is not adequately restrained or is out of position at the onset of acceleration. The FlexObile has several advantages over the ejection seat scenario. The upward motion of the Fulcrum arm compels the driver into the proper position into the seat. During the high deceleration phase, the force of the body is distributed across the entire cross-section of the seat with no high compression force to any body part. The high-pressure phase actually decompresses the spinal cord and the rotational motion avoids organs from peak pressure. The Flexobile is well within the forces and duration of tolerable safety limits. The operation of the FlexObile safety device appears to be simple, however, the actual Physics are quite sophisticated and will take several years to quantify all of the related forces. At this juncture, we have to settle on the fact that it works.